The #Vikings force another 3-and-out and TB will punt from their 13. 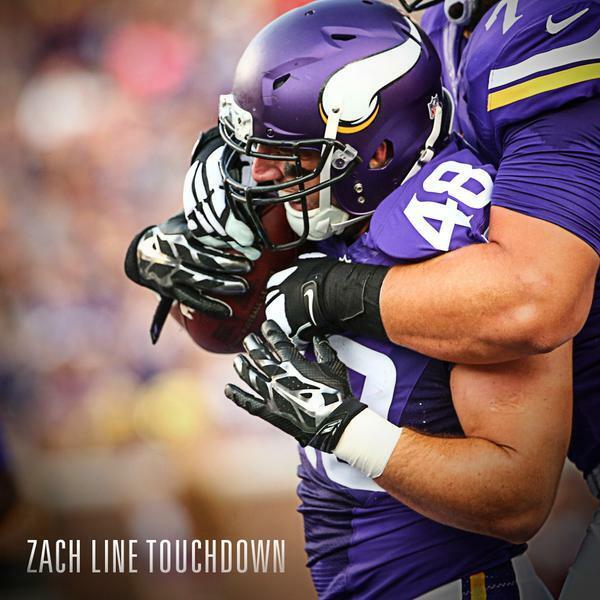 Watch the 24-yard catch by @Jay_wright4 that set up a one-yard TD run by @ZLINE48 .
.@g_hodges6 with the sack on 2nd down! These Bucs are doing a great imitation of the John McKay Bucs. 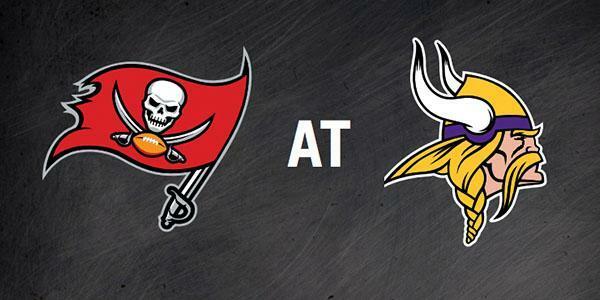 After a #Vikings punt, TB will start their next offensive drive on their own 10-yard line. Never realized how nice it is to play against a Leslie Frazier defense!!!! RT: @NFL : Too high for @MikeEvans13_ . Shaun Hill with his 2nd TD throw of the night. A 15-yard pass to @athielen19 puts the #Vikings up 23-3. Tampa Bay, in a word, has looked awful. Winston not getting many favors, but he's had two decent throws in debut. 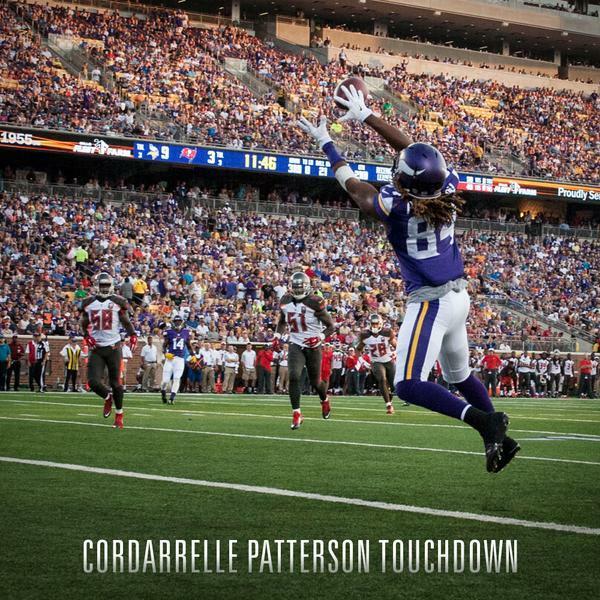 Shaun Hill with the 21-yard TD pass to @ceeflashpee84 . TB finds the end zone for the first time tonight but miss the two-point attempt conversion. 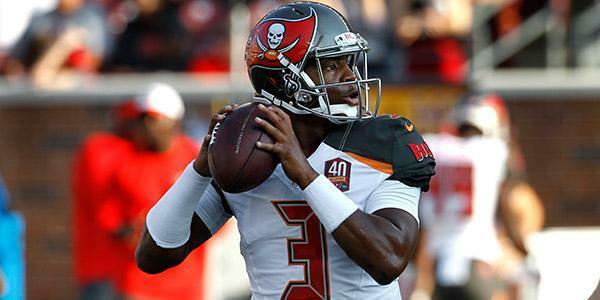 @Jaboowins runs it in from 8 yards out. 2 point conversion is no good. Bucs QB Jameis Winston (@Jaboowins ) is the first Tampa Bay QB with a preseason rush TD since 2011 (Josh Freeman, @ Kansas City, 8/12/11). 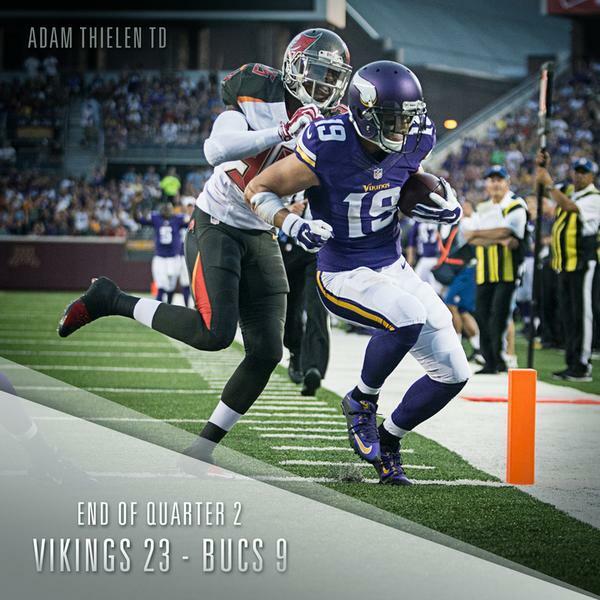 @athielen19 takes a short Shaun Hill pass for a 39-yard gain. Before construction gets too far along, @Vikings need to plan out some anti-wave measures in the new stadium. The #Vikings are kicking off to start the 2nd half. 2nd half is underway. 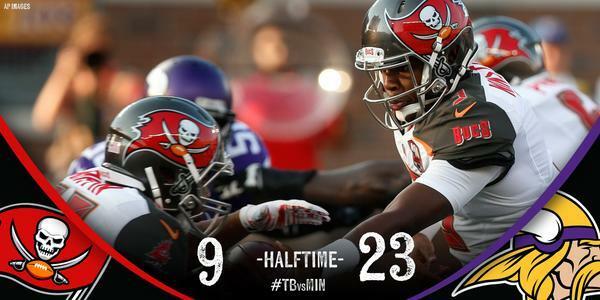 #Bucs receive the kick to begin the 3rd quarter. #Vikings ' first 3 draft picks on the field now with Waynes, Kendricks, Hunter. Watch @athielen19 score on a 19-yard pass from QB Shaun Hill. @stefon_diggs with a monster punt return to set the #Vikings up with good field position. Taylor Heinicke is now in at QB for the #Vikings . Tackle Demar Dotson (knee) is OUT for the remainder of the game.
.@BlairWalsh3 connects on a 42-yard FG!! !